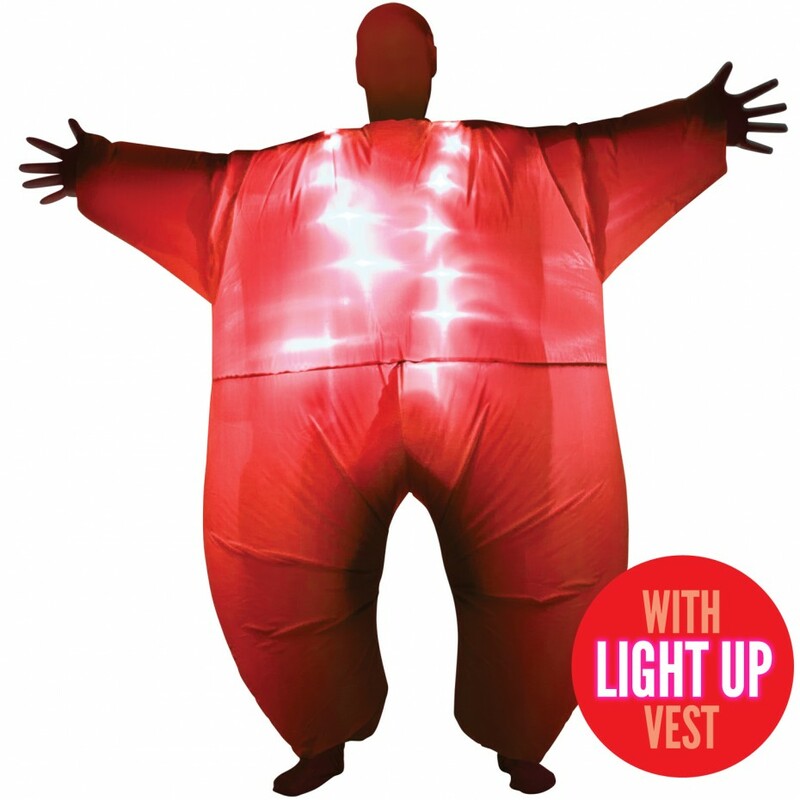 You’ll see inflatable costumes left right and centre on Halloween this year, so you don’t want to be left out right?! We have loads of incredible inflatable costumes in stock and they’re going to be the only costume you’ll want to wear this year. You’ll have seen the inflatable T-Rex costume online but we bet you haven’t seen it’s 50 million years later counterpart? That’s right we have the Before & After – Meteor edition! Our Inflatable Skeleton T-Rex Costume is set to be one of our bestsellers this Halloween so if you want one you really should buy one now. For the folks who like to push the boundary and have a good time! Our range of Naked Inflatable costumes are just the ticket for a stag do, fun night out, or for a fun Halloween costume. You can get the Fat Stripper Pick Me Up, the Naked Pick Me Up or the Fat Stripper MegaMorph. Who can resist being a big ball that lights up? Picture Violet Beauregarde but going to a rave. Fun right?! Our Light Up MegaMorphs are the key ingredient for a great night out so don’t deprive yourself of that and buy one now! Giant Pandas may no longer be endangered but we are still proud supporters of Panda fertility. The reaction on Facebook for our Giant Panda Inflatable Costume has been really great so you may need to hurry to get yours in time for Halloween! Don’t worry, we wouldn’t dream of leaving the kids out of Inflatable fun! We have a good selection for kids, including the Giant T-Rex, a Giant Skeleton T-Rex, the Giant Panda, and a whole range of coloured MegaMorph costumes.